As part of CASA’s work on the GeoVue project funded by the National Centre for E-Social Science we are proud to announce the release of the latest in a suite of software – PhotoOverlay Creator. 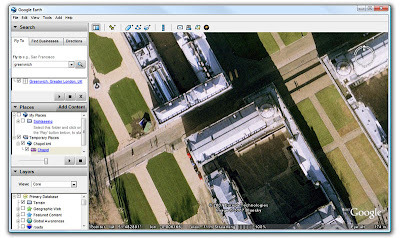 PhotoOverlay creator has been made specifically to place high resolution imagery into Google Earth. 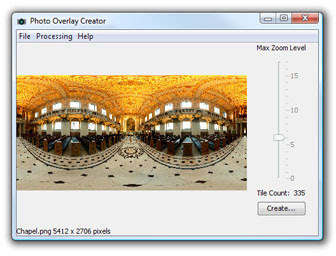 The tool supports full 360×180 degree panoramas, partial cylindrical panoramas and standard photographs or images, all within a simple point and click interface. Working in a similar manner to our Image Cutter software the program tiles your images and creates a KML file ready to put on your server allowing you a higher level of control over your imagery than is possible using web based services. 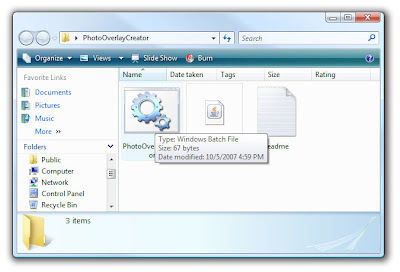 Download the software from here and unzip into a folder, note the software requires Java to be installed on your system which if required can be downloaded from Java.com. Loading the .batfile will open the interface which users of our other software tools, Image Cutter and Google Map Creator, will be familiar with. 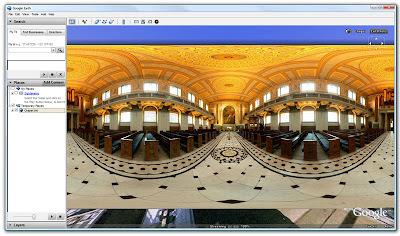 For this tutorial we are using a 360×180 spherical panoramic image of the Chapel of St Peter and St Paul in Greenwich, London. The image loads and a level of zoom is automatically set according to the images resolutions, in our case level 6. Once your photograph or image is loaded click ‘Create’ to be presented with options on Image Shape, Location and Description. Enter a description of your image – in our case information on the Chapel in Greenwich, this text will be viewable in Google Earth. 1) Rectangle – for all images apart from panoramas, the set Field of View (FOV) button provides options relating to the camera settings but the most part these can be ignored as the software will automatically set the correct sizes and aspect ratio. 2) Cylinder – for partial panoramic images or images that do not cover a full 360 x 180 field of view. The FOV settings are important for cylindrical images, these should be noted down via your stitching software and inputted accordingly. 3) Panoramic Sphere – for use with 360 x180 degree panorama images. 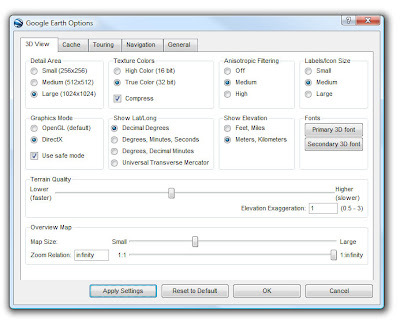 Select the Image Shape required as per the settings above, in our case Panoramic Sphere with the default FOV settings. As the images are located in geographic space it is important to load them at the correct locations, this can either be done accurately by noting the latitude and longitude of your image or roughly by choosing a city location from the ‘Look Up’ option and later moved in Google Earth. The Chapel of St Peter and St Paul is located in Greenwich, London, to get the relevant latitude and longitude we simply fly into the location in Google Earth and subsequently run the mouse over where the photo overlay is to be displayed. Make a note of the co-ordinates and enter them into PhotoOverlay Creator. Now simply click ‘Create’ and your KML will be created ready to view in Google Earth. If you want to share your image with the world via a webserver the KML needs to know the path to the image. Copy the KML over to your server and the file is ready to be viewed. Let us know if you use the tool as its always nice to know if we were on the right track…. Thanks go to Richard Milton at CASA for writing the code and making the idea work. Only one minor complaint/feature request: Please add a box in the program where one can specify the heading of the initial view in the photo. This would be especially valuable for outdoor panoramas where one wants to match the topography to the panorama – one can compare these by using the transparency slider. I had to do this manually by editing the KML file that was output by the program. Thanks very much. Keep up the great work! Hey! This is really great stuff! What a cool simple and powerful tool for the ImagePyramid feature in Google Earth 4.2! Good work and you deserve a pint or two! I have done a danish review and example with your tool – not with a fancy 360 panorama photo, but a simple rectangle photo. You need to zip the kml and tile directory up together, and rename it as a kmz file then Google Earth will be able to load the tiles. Thanks for the comments so far and really pleased to see it used. It turns out the photooverlay in GE doesent allow relative paths so the full reference to the image needs to be made in the KML file. This is why the examples so far posted dont load.. I have updated the tutorial with details, its just a simple tweak in notepad and then hopefully we can view the kml files so far. I’ve corrected my KML linked above to use the proper URL. Enjoy! Thoughts? Also any way to amke the fov wider for the pan? It sounds like its down to your servers Mime type and kml files are currenty being sent down as text. Let me know how it goes..
Soren – a nice review 🙂 thanks a lot – much appreciated and nice to see the tool being used. the tool has some potential, but seems very difficult to publish data properly. i can’t open my own files through ie and opera, only firefox sometimes opeens the application. changing mime settings in opera didn’t help. Great tool, have been having some fun with it, but have experienced a problem now. It worked fine the first few times I used it, now when I create a spherical Panorama although the panorama itself views ok, the thumbnail in the nav window top right show a image which is 3/4 black and shows the whole pano image in the top left quarter? I’m running OSX10.5.2 on MacPro 2.66 dual, viewing in google earth 4.2.0198.2451(beta). Thanks for the great addition to Google Earth. PhotoOverlay has proven to be a powerful, useful tool. I do have one inquiry however. Currently I am working on an area in Google Earth and inserting many spherical and cylindrical panoramas into a small space. Because the spheres that hover in space are so large, the area has become quite cluttered. Is it possible that I could create a smaller icon such as those used for placemarks that, when clicked, loaded up the .kml panorama? As well, I cannot seem to get my cylindrical panoramas to completely encircle themselves. That is they look like a soup can with a vertical slot cut out of it (I am using a 360 degree jpeg for the image). Is this the right view? Thanks so much and keep up the good work. Thank you for posting this great tutorial. The instruction is easy to follow. Love it! 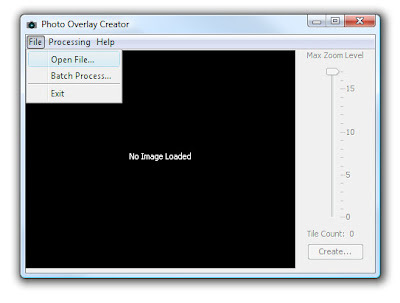 Did you know if there is a server solution for your image cutter software? I have been using this WONDERFUL java software for preparing GoogleEarth based panoramas for some months now, and I LOVE IT! THANK YOU to the developer and to all users who provide useful feedback! I’m working with large .JPG panorama images, some are larger than 150 MB. The program does not spawn errors to screen when it fails on a large file. and remove the “w” from the “javaw” command, you’ll get a CMD window that displays errors and status in it. This will show you a “out of Heap Memory” error when the file size gets to big for the allocated memory to handle. SO, i tried increasing the “-Xmx1024M” to “-Xmx2048M”, but this fails immediately. and it’s working quite well for the files I’m processing, perfectly normal operation. BTW, earlier docs for java indicate a “BigApps” parameter, but this fails completely, so I’m guessing that it’s obsolete in recent java versions. HOPE THIS HELPS other panorama addicts, I’m very proud of the OpenSource community worldwide for being so, well so OPEN!